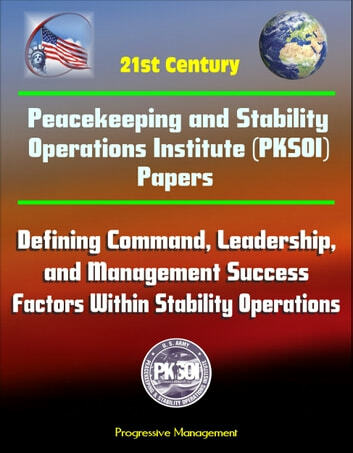 From the foreword: This monograph has focused on Command, Leadership, and Management (CLM) within a stability operational environment, although many of the lessons throughout can be applied to generic situations. The monograph takes a hypothesis from Keith Grint (who has long studied CLM) and applies it to a number of case studies in the Balkans, Iraq, and Afghanistan. It then combines these results with qualitative interviews with a number of selected key players who have been involved in the delivery of Stability Operational effects. It does not end there—the conclusion provides a focus for further development of what is deemed to be an initial foray into this field of study. The topic of this monograph is important. Issues such as the impact of globalization, the various causes of international instability, and the issue of whether to militarily intervene will resonate for at least the next decade or so. Where military intervention is deemed necessary, how this intervention is executed by those in power is vital to success. 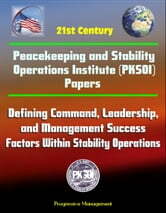 Any guidance that can be provided to the commanders, leaders, and managers within this operational environment can only help towards positive and successful end states. Major Fielder has produced a significant piece of work during his deployment in Iraq that hopefully will add important value to this field of study. It begins with some definitions of Stability Operations used to provide a framework upon which to base the study. The whole arena of Stability Operations suffers from disparate and wide-ranging definitions, doctrines, and methods of delivery; thus a baseline is provided. Concepts of State, based on the Westphalian Principle, are provided by Lord Paddy Ashdown, who has a wide degree of experience as both a military officer (Royal Marine), a politician (Leader of the United Kingdom [UK] Liberal Democratic Party), and also as the United Nations Office of the High Commissioner for Refugees (UNHCR)/European Union Special Representative (EUSR) in Bosnia-Herzegovina. Ashdown also provides a very usable framework of Success Criteria based on his experiences. Next follows a key discussion about getting things done, using a conceptual framework of CLM based on a methodology from Grint. Grint talks about problem solving and his concepts of critical, wicked, and tame problems are aligned directly to CLM styles of getting things done. The paper concludes with definitions of the strategic, operational, and tactical levels of operations and how they may be useful to add depth beyond a 2-dimensional view of CLM. Some attributes of these levels are discussed in outline and are used throughout further discussions and analysis.